Getting the right information to 7,500 staff, located across a number of hospital and primary care buildings, calls for precise project management and nerves of steel. It's one of the reasons why many medical centers have introduced a color-coded notification system to build more effective internal communications. For a large medical facility in America’s mid-east, they’ve introduced a highly effective method to communicate such codes – and much more. Urgent or unexpected events, such as an approaching severe weather incident, a scheduled event such as an IT system upgrade, or an upcoming initiative like a town hall meeting, require careful co-ordination and targeted distribution of messages. And most importantly, they must be read. Efficient internal communication is always a challenge in a fast-paced, unpredictable environment like a hospital. Not every employee has a computer, many work shifts, and they are often away from their desk. There’s a requirement to keep noise levels to a minimum. And the unexpected can happen at any time. While email is used for some messages, the hospital spokesperson says this channel is not suitable for important, time-sensitive content. “Email is an over-used channel with no guarantee when staff get to it,” they explain. On the rare occasion of an emergency situation developing, employees require status updates and critical information, otherwise they potentially put themselves or their patients at risk – a primary concern for every public service facility. The hospital sought a real-time communication solution that would bypass email, be quick to activate if needed, and be effective at message cut-through. With email no longer a viable channel for important ‘push’ style notifications, the hospital introduced a range of SnapComms channels, including desktop alerts and scrolling tickers. The popular desktop alert displays as a pop-up message window, straight onto staff computer screens. In the case of an extreme emergency or important notification, the alert can be set to take over the entire screen. The desktop ticker is a moving ribbon of text across the bottom of employees’ screens. Its concise format is perfect for bite-size chunks of information, without interfering with the employee’s main application open on screen. Both tools are ideal for a medical environment, where Press Ganey Quiet Scores are monitored and assessed as per HCAHPS star ratings. Like most hospitals, this facility has several codes for communication purposes. For example: code yellow = large influx of patients, code red = fire, code silver = active shooter, and code black = severe weather (such as a tornado, a recurring threat in this part of the United States). This hospital has a series of pre-defined colored desktop alerts and tickers to match these codes, ready to publish within seconds. 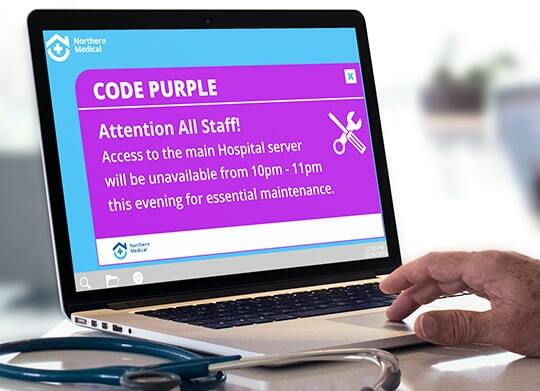 One of the most commonly used is code purple – IT system alert. A spokesperson explained, “We have regular, scheduled ‘change windows’ whereby an application is either being retired or upgraded. “To make sure affected staff are aware of these IT events, we roll out a series of message via tickers. These give basic details of what’s happening and when, and if necessary, points people to other places for more details – such as the Intranet. These unmissable assets are great for countdown-style messages and requesting employees to take action. They can be easily customized to suit branding requirements. The success reports reveal who has or hasn’t opened the message, facilitating easy message follow-up. Since the hospital started using SnapComms internal communications software, they have become invaluable. “These tools have become ingrained in our culture,” they say. “We can’t imagine how we’d communicate urgent issues without them! This saves the center significant time and resource in responding to multiple tickets about the same issue. They conclude, “We’ve developed a close relationship with the SnapComms team, who have been exceptional in meeting our template customization, technical support and customer service requirements.